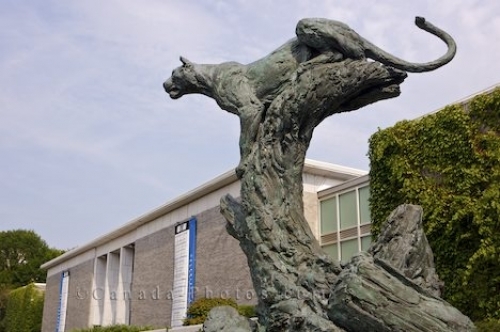 As people arrive at the entrance to the Beaverbrook Art Gallery in downtown Fredericton, New Brunswick, a beautiful sculpture known as "The Leopard" is on exhibit. The sculpture was created by artist Jonathan Kenworthy in 1985. The leopard is positioned on a tree in a stance which resembles how this animal prepares itself before attacking its prey. Jonathan Kenworthy was inspired by people's and creature's survival tactics in remote places where his love for Africa blossomed. Many of his sculptures, like that of "The Leopard", originated from places like Asia, Afghanistan, Nepal, East Africa and Egypt. Sculpture "The Leopard" by artist Jonathan Kenworthy at the entrance to the Beaverbrook Art Gallery in downtown Fredericton, River Valley Scenic Drive, Highway 2, New Brunswick, Canada. Picture of "The Leopard" sculpture created by Jonathan Kenworthy outside the Beaverbrook Art Gallery in Fredericton.